Simply Living: An album of 'Now and Then' photos! An album of 'Now and Then' photos! Our four children gave Ralph and me the most special birthday gift. It may just be the best birthday gift I've ever received! Since both of our birthdays are back-to-back - his on October 26, mine on the 27th, we celebrate them together and this year, all of our children came home to celebrate with us. Although people were in and out for much of the month, because of schedules, there was only one full day when all of us were in the same place at the same time. Despite the lack of time, Jenny, Amber, Timmy and Toby somehow managed to take a series of very specific pictures that they put together in an album. What a difference 22 years make! They weren't any old pictures. 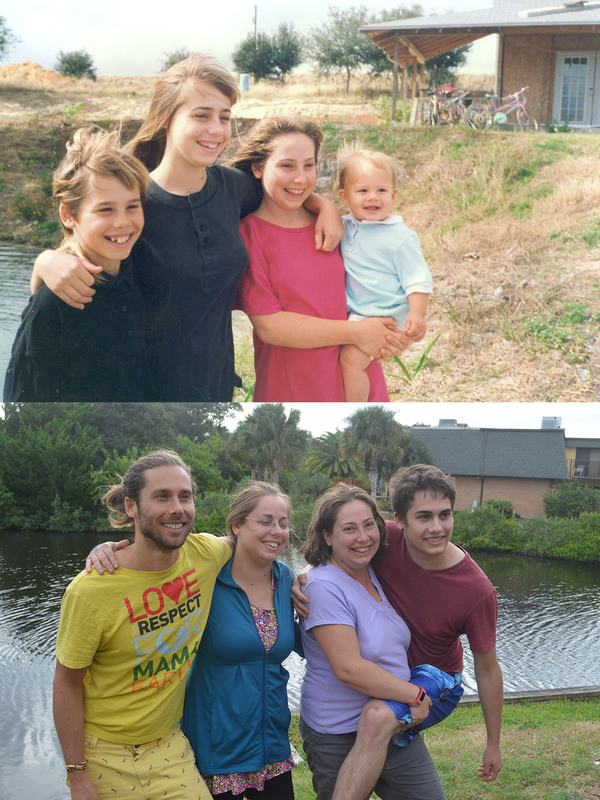 They were pictures that matched ones taken years before when they were little kids still living at home with us. They assembled the photos side-by-side in an album. Such fun and creativity! Thank you Jenny for making it happen and Amber, Toby, and Timmy for taking part. I love it! When we were all at the beach the other day, I couldn't understand why Toby was sitting there making such a big pile of sand. I get it now! "I growed it myself!" Jenny (and cat) with broccoli from the garden. Once a gardener, always a gardener! Gee...34 years have gone by so fast! Note that baby Jenny (and her grown up self) are both holding their book sideways! Love the then and now photos. That is such a neat idea to do. You can see their children faces in their adult faces still today, with the exception of the littlest one who was too young at the time. i still can't get over what a special present this was. i love that my kids made it happen. took me totally by surprise. Enjoyed the family photos. What a great idea from your thoughtful children. It really was and it took me totally by surprise. A wonderful surprise!